What a start to the 2015 baseball season for the New York Mets and it couldn’t have come at a better time. I certainly didn’t realize that when Beltran took Adam Wainwright’s curve ball for a called third strike in the 2006 NLCS, we would have to wait 9 years for good baseball again. Yes, we started out great in 2007 and 2008 but major collapses and no postseason berths set the tone for the next decade. (I also understand that 9 years of futility isn’t that long compared with some other franchises, however it’s been a while since exciting Mets baseball). As fans, we stood firm every April, trying to get behind the optimism that the front office was selling but also realizing that we were far away from competing for a postseason spot. Havery’s Tommy John surgery took 2014 off the table as THE year of a return to relevance so that put a lot of pressure on 2015. New York fans are only so patient. The San Francisco Giants (a team that wore the current Mets logo from 1948-1957) has won the World Series three times since our last playoff appearance. A quiet offseason worried many that the front office was still unwilling to commit to a winning team. But a solid Spring that featured loads of quality young talent coupled with an overall thirst for something to be excited about had expectations high. Starting the season with two of three against the Nats and the dominant return of Matt Harvey was exciting enough. But to rattle off 11 straight wins and start the first homestand of the season 10-0 has me and the rest of the fan base in a tizzy. I know that it’s only April but I haven’t been this excited about Mets baseball since 2006 and we finally have a reason to be optimistic. One could argue that this winning streak has come against the bottom of our division, but good teams are supposed to beat the bad teams in their division. Not to mention that we have played through injuries and changes to the lineup without missing a step. Wright, Wheeler, Mejia, D’Arnaud and Blevins are all out for varying lengths of time yet it’s the next man up and we keep winning. Duda is an emerging star and Granderson continues to get on base. Wilmer Flores looks like a major league shortstop and Juan Lagares might be the best defensive centerfielder in the game right now. It’s a small sample size of course and a regression is likely but I’m not apologizing for being ecstatic about this start. Citi Field has been electric early on, so much so that Michael Cuddyer said he got chills standing in left field during a big out early on in the homestand. Mets fans have been longing for something of a good baseball team to latch on to and it looks like we’ve finally got it. The team believes that it can win and belief is a powerful thing. A loose clubhouse and confidence can take any baseball team a long way. And if those two characteristics fall by the wayside, our starting pitching should be there to pick up the slack. I’m hard pressed to find a weak spot in our rotation right now and it’s a blast watcing Colon, deGrom, Harvey, Niese and Gee go to work each night. Terry Collins knows he’s fighting for his job, the Mets organization knows it’s fighting for its fan base and the guys on the team know that the time to win is now. 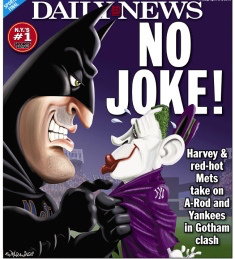 There’s been talk of the Mets taking back New York. Well, what better way to signal the shift in New York baseball than setting a franchise record for consecutive wins in the Bronx? This is the most important Subway series since the 2000 World Series. 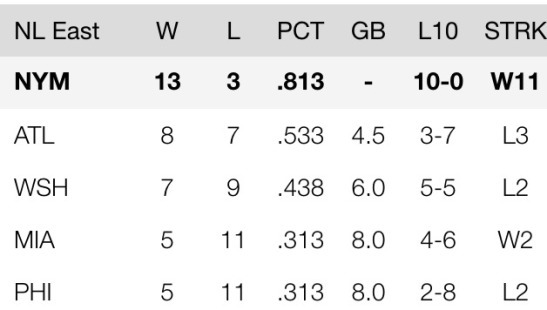 Both teams are in first place and although it’s only April, this series can prove that the Mets can win important baseball games. So far a little belief has taken us a long way. Here’s to hoping it will continue all the way to October.